Tax Returns. Tax returns can provide crucial information about your income and your spouse’s income. These forms can be useful when determining alimony amounts and child support amounts. Tax returns can also give your divorce lawyer a good sense of your financial situation. Bank Accounts. If you share a bank account with your partner, it is important to take steps to protect your finances and your money, especially if you are about to break the news to your partner that you want to get divorced. If you are concerned that your spouse might hide assets or accounts, the time to gather this information is now, before you break the news about your desire to get divorced. Prenuptial Agreements. 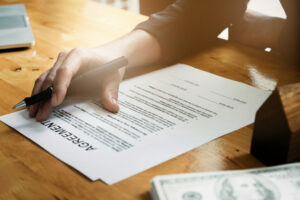 If you signed a prenuptial agreement before you were married, bring a copy of this document to your initial meeting with the Elliot Green Law Offices, Brooklyn, NY divorce attorneys. We can review the agreement, help you understand whether it is enforceable, and help you take steps to protect your rights. Information about Investments and Retirement Accounts. Investments and retirement accounts must be divided with care. Failing to properly divide these accounts can result in tax penalties. The Elliot Green Law Offices, divorce attorneys in Brooklyn, New York may be able to help you with dividing your investments and retirement accounts. When dividing retirement accounts, it is also important to consider the potential tax burden of these accounts. Mortgage or Deeds. If you own property, bring copies of titles, deeds, or any mortgages you might have. If you pay a monthly mortgage amount, bring this information to your initial consultation. Debts. Any credit card statements, car loans, or other debts you might have should also be brought to your initial meeting with your divorce lawyer. Your divorce attorney will want to understand your whole financial picture, including assets and liabilities. The Elliot Green Law Offices are divorce attorneys in Brooklyn, New York who can also look at student loan debts to determine whether these are shared debts or whether these debts belong solely to you or your spouse. Criminal Reports. If your ex has been abusive, has been arrested, or if you have had to get a restraining order against your ex in the past, bring any relevant criminal reports or documents supporting this. This information could assist your divorce lawyer when it comes time to work on your parenting plan. Text Messages, Social Media, and E-Mails. If you think you have any information from text messages, social media, or e-mails that might be useful to your case, bring these along to your initial consultation. Medical Records. If you spouse has a history of mental illness or has a history of serious and debilitating illness, this could impact your parenting plan. Bring any medical records you might have. Any Separation Agreements You Might Have. Ideally, you’ll want to meet with a qualified divorce lawyer like the Elliot Green Law Offices in Brooklyn, New York to assist you with your separation agreement. However, if you and your ex already have a separation agreement, bring this to your initial meeting. Questions you Might Have. Don’t put too much pressure on yourself to get every document together before your first consultation. While it can be helpful to have this information organized, your lawyer can guide you when it comes to putting together a list of your assets and liabilities. What is important is that you begin to gather this information and that you speak to an attorney as soon as possible to begin the process. The Elliot Green Law Offices understand that you’ll need to get quite a bit of information together when getting divorced. The information you’ll need will also vary depending on your situation. The most important thing you can do if you are facing divorce is to schedule your initial consultation with the Brooklyn, New York divorce lawyers at the Elliot Green Law Offices as soon as possible, and come prepared with any questions you might have. Divorce can be an overwhelming process. Fortunately, you don’t have to navigate it alone. The Elliot Green Law Offices are divorce lawyers in Brooklyn, New York who can review your situation and help you navigate filing for divorce. Bring as much information as you can to your initial consultation. Our compassionate and caring attorneys will help you sort it out from there.